My plasterer managed to track down the cornice, thank goodness. But of course that wasn't without drama either - the place that makes it wanted to charge me $200 for delivery. The cornice will cost about $12. My plasterer quite rightly said thanks but no thanks and is going to get it for me tomorrow and will finishing on Tuesday. Yay! So if I don't melt from the hot weather and lack of fan (another point I forgot to add in previous post: fan control broke so no fan until we get a new one), I should be able to start the painting sometime next week. Then we're on to boring stuff like moving powerpoints and the air conditioner so it's not in such a stupid place, installing new fans and a few wall lights. And then the kitchen. Poor old kitchen. It's always one step forward, three steps back with that one! 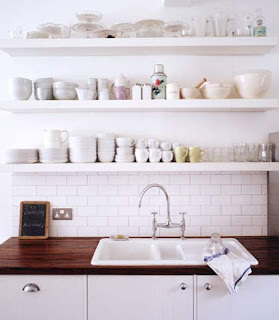 I do have one question someone might be able to help me with: I'd love to have a white porcelain sink in a wooden benchtop but realise the lack of drainer, water and wood won't be the best combination. So, has anyone seen a sink like this one in the picture above in Australia? It looks like it has a cover over one side of the sink or it is a drainer, I can't tell for sure, but either would be ideal as I plan to do as little handwashing as possible seeing as I've been without a dishwasher for the last 10 years. And I don't want the Ikea one that sticks out of the cupboards. Oh so picky I am! Have a good long weekend. And I'll try to be a better blogger next week. I seem to say that a lot, don't I? Sorry! calendar event: meet Amy Butler! wanna be in cosmo pregnancy? oh my god, the mess! oh my god the drama!!!!!!! !